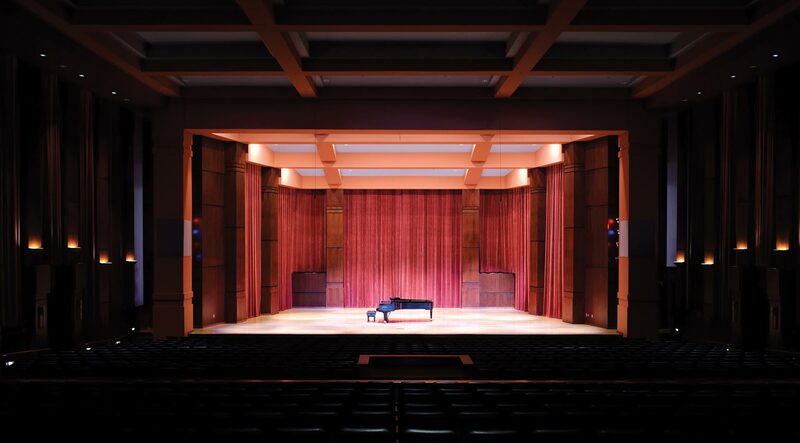 Riceland Hall, a 970-seat auditorium, is acoustically designed and shaped for music functions, spoken presentations and public forums. The side walls feature motorized acoustical drapes to change the quality of the hall to accommodate various kinds of performing groups. Even the air-conditioning system was designed to provide air movement without distracting noise. The 2,000 square foot oak hardwood stage will accommodate a large orchestra, an orchestra with choir, and a wide range of media presentations. Additional areas associated with the hall are humidity-controlled piano storage, riser storage, dressing areas, and a receiving area adjacent to the stage.